Takamine guitars are made at the foot of the Takamine mountain in Sakashita in Japan; the company has been producing guitars for over 40 years. Working out the date of your Takamine guitar is easy for most models, and with the aid of a serial number you can usually pinpoint the age of your guitar down to the precise day on which it was made. Locate the serial number on your guitar. This will be inside the sound hole, on the interior of the body. The serial number will generally be eight digits long. 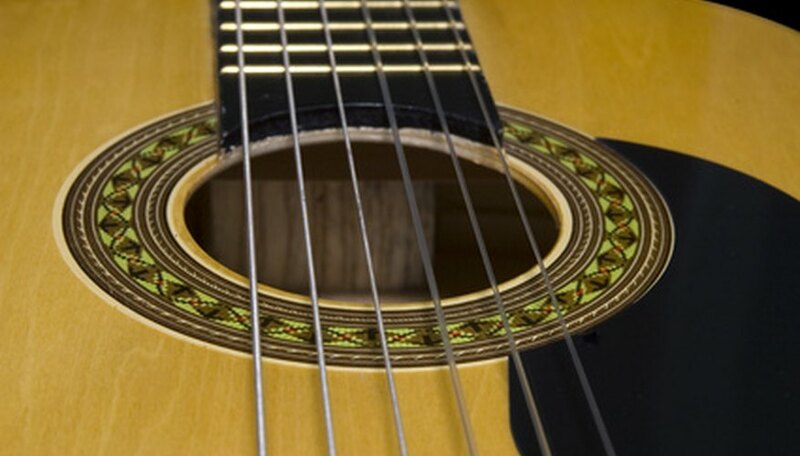 The serial number can be used to date the guitar on all Takamine guitars other than the G series, which do not have a simple rule that can be used to date them. Copy the serial number down onto a piece of paper. You can run the serial number through the Takamine dating engine on Guitar Dating (see “Resources”), but it isn’t necessary because the date is easy to extrapolate from the serial number. Note the first two digits of the serial number. This is the year in which your guitar was made. The Takamine company was only founded in 1962, so any low numbers will be relating to the 21st century as opposed to the 20th. Read the next two digits. These represent the month in which your guitar was made. “01” in these spots would be indicative of a guitar made in January, and “12” would mean the guitar was made in December. Convert the following two numbers to a date. This is literally the day out of the month that your guitar was made on. The clear structure of the Takamine serial number system makes it easy to work out the exact day your guitar was made on. A guitar with a serial number starting “050108” would have been made on the eighth of January 2005. Note the final two digits for the maximum amount of precision. This final piece of information tells you the number of your guitar in the manufacturing day. For example, a guitar with a serial number “01081423” would have been the 23rd guitar that was made on the fourteenth of August 2001. This allows you to date your guitar with considerable accuracy; you can assume that lower numbers will have been produced in the morning and higher numbers will have been made in the afternoon.